The whole week there has been an unseasonal northerly wind in Medemblik – this has provided unwelcome lumpy waters in the IJsselmeer at Medemblik. The combination of wind and waves has been big challenge for many sailors. Sailors who are used to these conditions have an advantage and, so, many of them are doing well in the results. Regardless of the wind direction, wind strength has created good conditions for serious racing for all competitors. 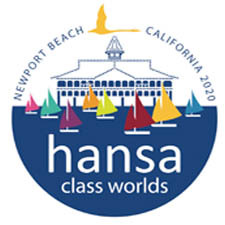 Tuesday morning was scheduled for the single handed sailors: Hansa 2.3, Liberty and 303 singles. 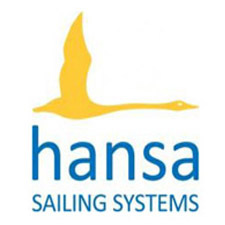 Race Officer, John Borsboom decided to extend the courses for the Hansa 303s and Libertys. 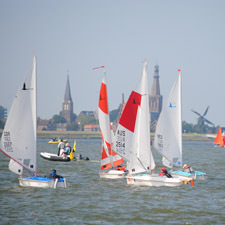 With the good sailing conditions, Borsboom extended the course length to meet the target time of 40 minutes per race for all 3 classes. After six races in the Hansa 2.3 class Malaysia’s Al Mustakin Matrin, is undefeated so far: “I’ve sailed six races in a number one position. I’m definitely going for the gold medal”. In the Liberty, his countryman Azmi Ani has sailed consistently at this regatta and is currently in third place. New Zealander Sarah Dunckley is still leading the fleet into day 3, despite an uncharacteristic error which saw her OCS is race 5. In the SKUD18 races, the Polish team are developing a small advantage. With a first and second place today they have a total of 7 points. Great Britain is in second place with 10 points and the Dutch, on home ground, are on a third place with 11 points. It’s still very close racing, with both Great Britain and Holland hard on the heels of the Polish team. Individual race and overall results can be found here.